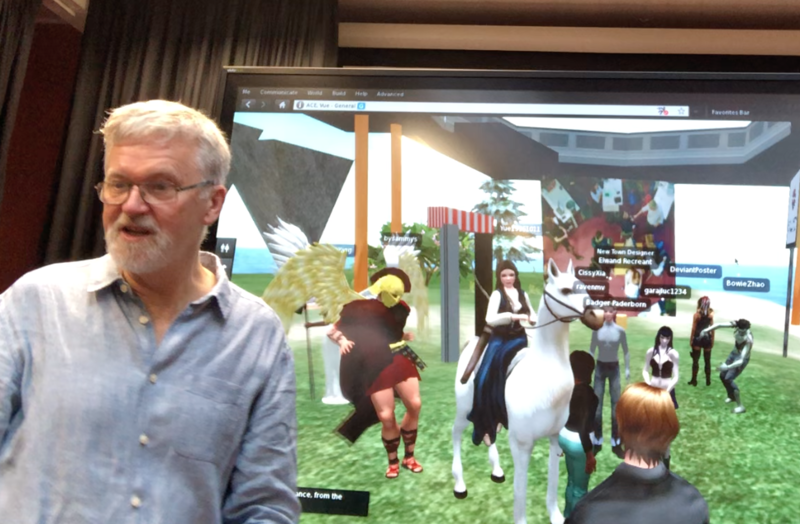 It’s eleven years since I explored the shared 3D world of Second Life. The University of Edinburgh owns a virtual island there, and in 2006 I was gifted a small promontory of land on which to conduct some experiments. This playground nook was always a mess. 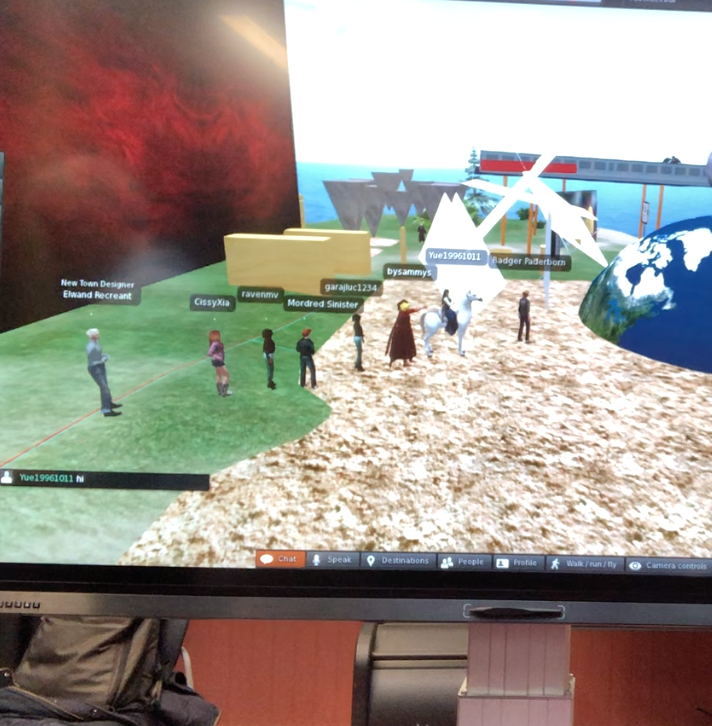 One of our team created a stylised version of our real-world teaching space (the atrium); there was a booth for playing music, and lots of cubes, spheres and other ruins lay on the ground or hovered mid air. A giant octopus hung frozen 15 meters above the sea. 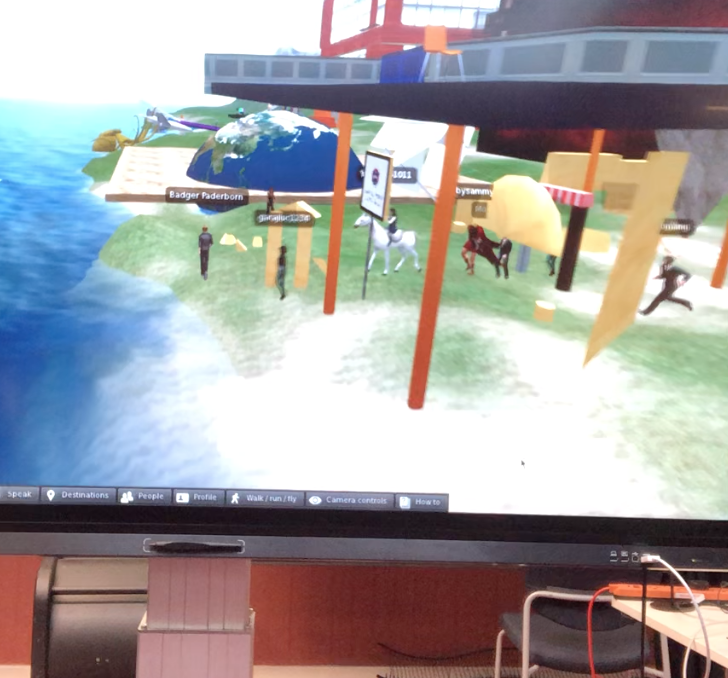 I went back last year to show students in my Media and Culture class what a virtual environment could be like. But by then I had lost all rights to build on our land, or make adjustments. I couldn’t log on as my old avatar, Badger Paderborn, so I had to create a new identity, which I called Blockard. I could then visit our land and show it to others, but as Blockard I had no rights to build, or do a clean up. So this year I contacted Linden Labs who brought my old avatar back to life. I had accrued unpaid debts of several Linden dollars, so they closed my account some years ago. You pay for certain rights, and residents buy virtual objects and clothing from one another. It’s a commercial operation after all. I paid my debts and came back to life as Badger Paderborn. The body, clothing, hair and modifications I adopted eleven years ago were gone, and I had to select a new, youthful, body from the catalogue. I was Badger Paderborn re-born. Now I could do a clean up, which is to send objects back to their original owners. I installed a display board with a class photograph. I coaxed the giant octopus back into the sea. 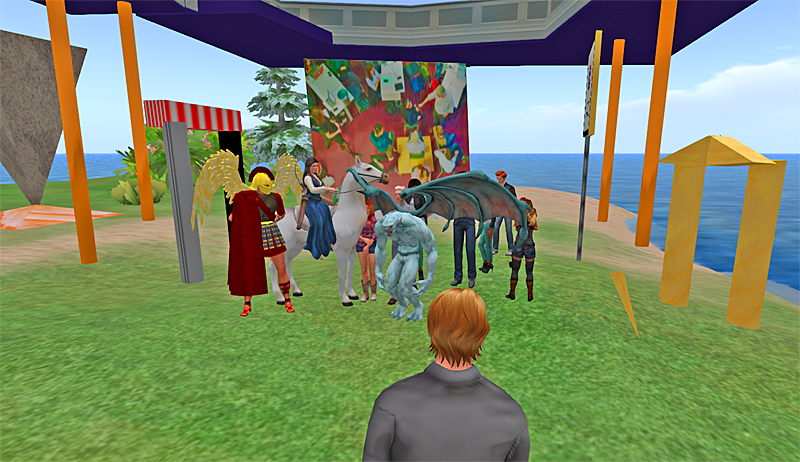 Earlier in the week, ten volunteers agreed to meet me in Second Life during class time, and with little preparation. With my renewed status, I could add them to my group, which meant these rookie residents could also build on our promontory. Here’s what we did. 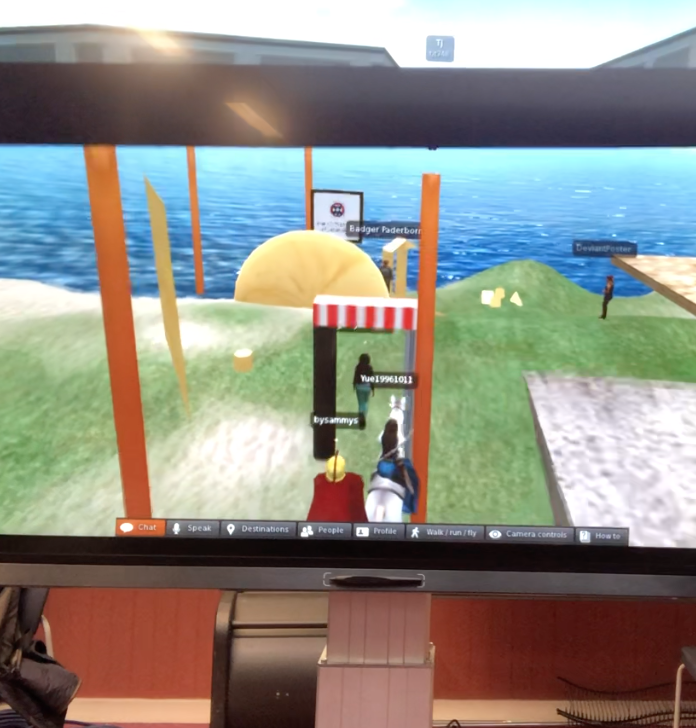 The class watched on a big screen while the ten residents and I assembled at our virtual atrium. I demonstrated the simple procedure for building on the site. I then set them the task of working in pairs to each build an arch. The class voted on the best arch. The one with the striped lintel won. We celebrated by forming a conga line (or perhaps just a queue), and processed to music around the site and through the arches. That ended in a free-for-all as residents discovered they could fly, and that they could change their avatars into something exotic. The audience throughout thought the spectacle hilarious. We reconvened for a group photograph. The intellectual context of the experience was along the lines described in the post Vitruvius does steampunk. Also see Data waste and Fake followers.